This print makes the perfect gift for gardeners and green thumbs in training. From the elegant English Ivy and swooping String of Pearl to prickly cacti and spiny air plants, all things green need a little TLC from time to time. The inspiration for this verdant illustration came at a time when artist Libby VanderPloeg was on the road often and counted on her friends to take care of the flora in her home. To help them navigate her indoor greenhouse, she painted a handy guide to tending greenery of all sorts. 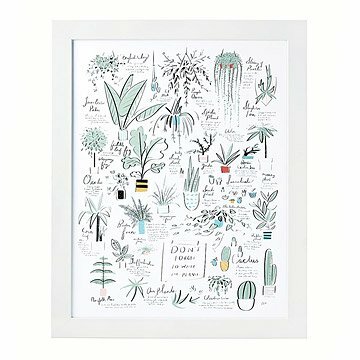 Lush with common houseplants and charming hints and tips for what helps them thrive, this print makes the perfect gift for gardeners and green thumbs in training. Designed in Brooklyn, New York, printed in Oregon. Libby VanderPloeg lives and makes work from her studio in Greenpoint, Brooklyn. She grew up in Michigan on the edge of the Great Lakes dunes, and has lived in Chicago, New York, and Stockholm. A mix of beauty and humor, Libby’s work comes out of her deep affinity for storytelling, music, letterforms, printed ephemera, and nature. Her illustrations often fold in conversational scribblings of her musings, thoughts and observations drawn from quiet strolls around the neighborhood and conversations at the coffee shop. She rarely meets a situation she would not like to draw. Arrives ready to hang in a BonanzaWood frame, or unframed rolled in tube. I love the picture. Bought the unframed one. Only complaint is that it comes shipped flat instead of rolled like it says in the description. Had to return the first one since it got bent. Second one arrived undamaged but still shipped flat. So who wants dead flowers on a wall? I like curious people and want my visitors to look at my house and determine that I have an imagination and a variety of interests. This picture gives them information that they might not otherwise have known and maybe they'll remember when and where they learned it. Nice piece of artwork for the garden/plant lover in your life. Little quotes are pretty funny (if you are familiar with the plants). Drawings and colorings are very nice and high quality. Love this print! I needed something a little bigger downstairs, and this perfectly brings out my love of indoor plants. So pretty! Fits perfectly near our seedlings. Trying to start a garden in our new house. This is a really fun piece of art to add to your home. Especially for the garden lover!